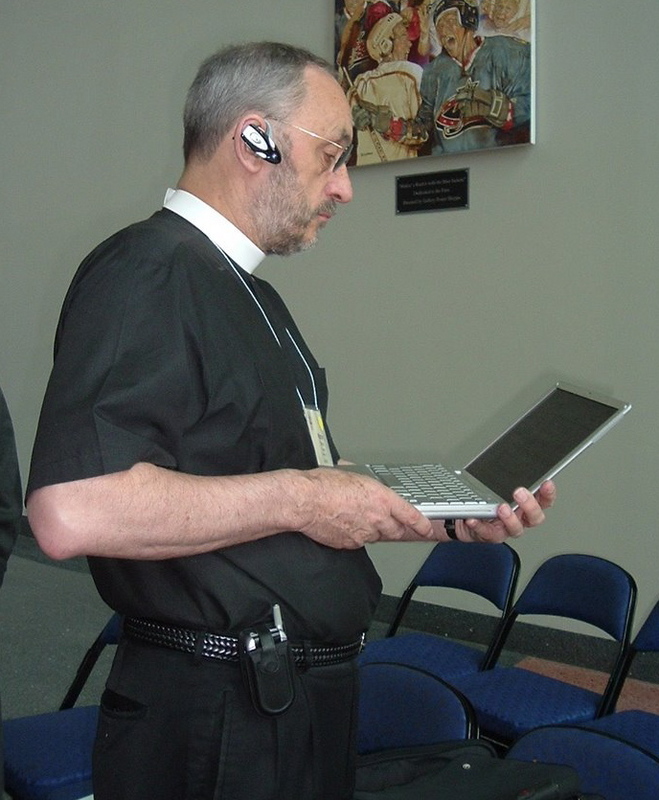 Cafe regular Kevin reminded us this week that even BabyBlue has had access to Bishop Minns’ laptop (here’s a photo of Martyn Minns at Columbus as he apparently runs the entire Anglican Communion single-handedly from his laptop and cell phone). Many of you who have been dropping into the Cafe since the very beginning may remember the disaster that fell upon us while at Columbus (no, this other one). We, of course, remember it very well. We were in the depths of despair. We were nearly inconsolable. We were sitting in the bar of the Plaza Hotel contemplating another gin and tonic and watching the grass grow as we stared forlornly at our own beloved PowerBook, sitting in front of us on the table as the glow of the Apple logo reflected into our empty glass and we listened, despairingly, to the sound of the hard drive going crunch, crunch, crunch. It was not a happy moment. I had a major disaster last night. I had just taken a photo of Greg from Stand Firm and Jenny from the ACN and plugged the camera into my laptop to download when the whole laptop (I just got it in March) froze up. It’s been frozen ever since. All I see is the “Apple” and the sound of something trying to get started on the hard drive (as though the laptop is trying to boot up but is stuck). Last night I ended up at Max and Erma’s over at the Crown Plaza with my laptop and Martyn Minns laptop trying to research what could be done (he has the same type of laptop as mine). We all even prayed over the laptop (NOTE: The Episcopal Church has been writing new prayers at this General Convention for all sorts of activities – do you think they could ask a special prayer for sick laptops? Maybe they could be inclusive and include prayers for both PCs and Macs?). I worked on it until past 11:00 p.m. and still – all I could get up was the shining Apple logo. I was crushed. What would I do? Here we were at the final day of General Convention and I have crashed. My blogging colleagues here in the newsroom have been suffering through similar disasters as their servers explode (I actually thought I saw smoke coming out of Mike and Greg’s ears at one point). Now I was joining them in the dungeon of despair. This was devastating. Martyn and Angela came to my table at Max and Erma’s and were so incredibly supportive. Here the church is frozen just like my laptop and theological and political fires are raging and I am in the depths of despair over my laptop. Their kindness – and the kindness of many others meant more to me then – dare I say it – even the laptop being healed, er fixed. People were praying. I knew there must be a way through this. At the last moment I had decided to take my MacMini to Columbus – the box, the screen, the keyboard, the mouse, the whole chebang. I had planned to do podcasting live from Columbus (I’ve managed to do one which you can hear by going to the iTunes Music Store and search “podcasts” by typing “BabyBlueOnline”). But the Internet connection was so poor in the hotel it was extremely time consuming – and time is precious here. So I had been thinking that it hadn’t really been worth it to lug the whole machine to Columbus. So here I am – I got to the newsroom early so I could set up the whole rig without too much ribbing from the Pirates (the guy bloggers) in the newsroom. In fact, I may take a photo of it so you can see. MacMini’s are cool – don’t leave home with it it. Backup is always a good thing to have, one way or the other. 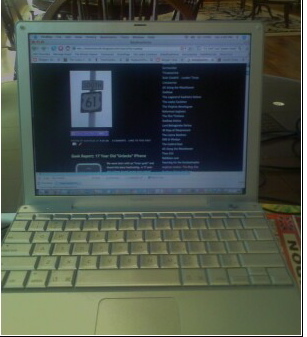 What we can tell you, laptops can be restored (see photo left). They can be better than they ever were. May it be so about other news of fresh disasters. 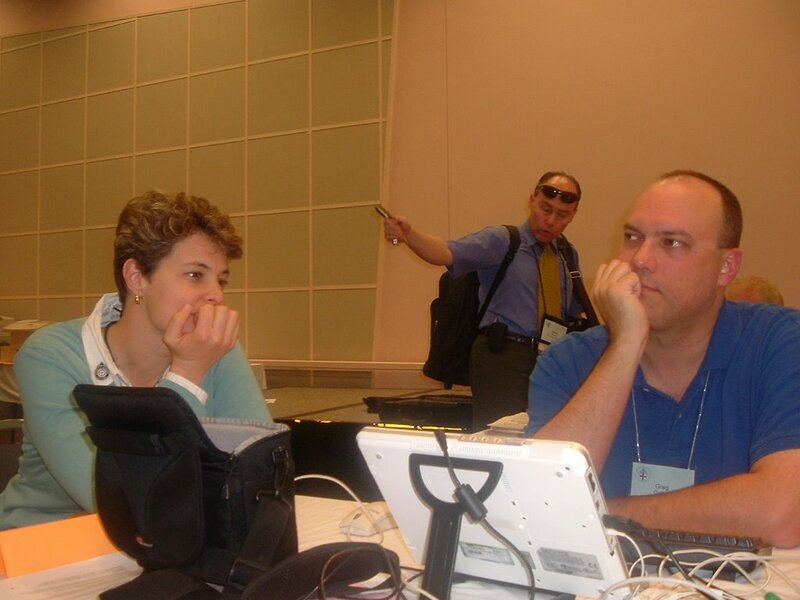 This entry was posted in Anglican News, Episcopal News, http://schemas.google.com/blogger/2008/kind#post, Podcasts. Bookmark the permalink. The Church Times should offer that apology and fire the journalists responsible. Jim Naughton, Susan Russel and all the other liberals who gleefully posted racist screeds on their blogs should be deposed and fired, and their pensions canceled.